Bourbon has always been thought of as a man’s world, but women have been an integral part of the industry. From the beginning women have been distillery owners, executives, tasters, and bootleggers. On this tour you will be introduced to these bold women who defied the expectations of their time by making their way in a man’s world. You'll then be introduced to the modern counterpart of these audacious women by visiting the three distilleries that have women as their Master Distillers. They are adding to the rich story of Kentucky’s bourbon history. The tour will last approximately 8 hours. 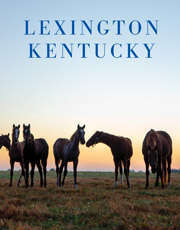 Pickup will be at the Lexington Visitors Center or the James E. Pepper Distillery. Price includes lunch, along with tours and tastings at all three distilleries. Water and snacks will be included.